A few days ago, I was sitting at the kitchen table enjoying a cup of tea when my 10-year daughter came up to me with a piece of paper in one hand and her tablet in the other. By the look on her face I could tell there was a question coming. It turns out she was working on an inspiration wall for her bedroom and wanted to run some potential quotes by me to hear my opinion. After reading her choices aloud, she asked if I knew of any inspirational quotes. After that semi-deep conversation, I started thinking more about the quote that I provided to her. It really is very important to take care of yourself. As parents, we need to find time throughout the day just for ourselves. Sometimes this can be quite challenging. 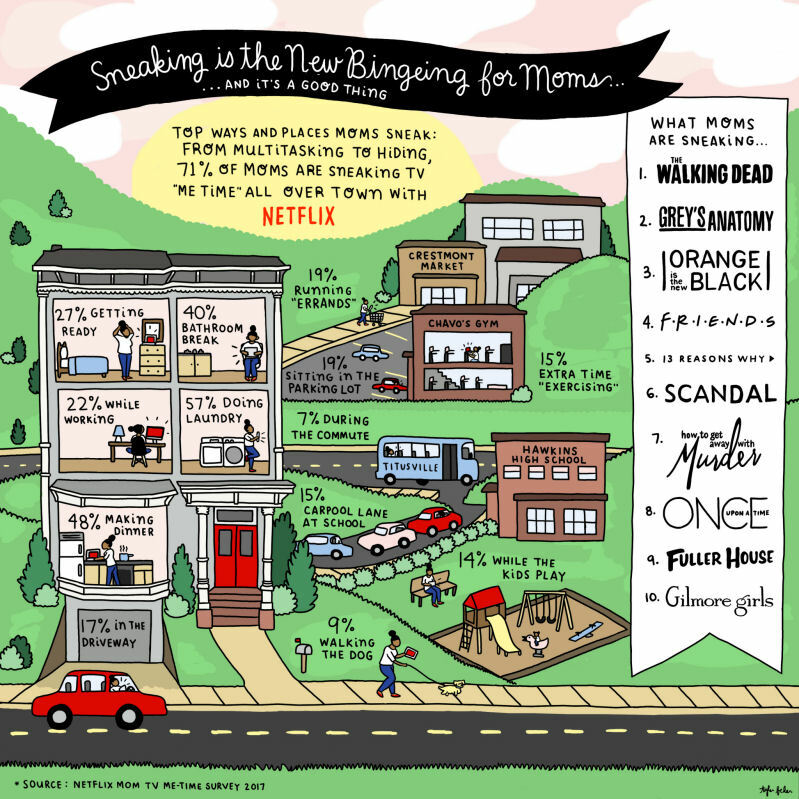 One of my favorite “Me” activities is to sneak (#MomSneak) in a bit of Netflix every day. Watching 15 or 20 minutes of comedian “Dave Chappelle” or catching an episode of one my favs like “Orange is the New Black” (#OITNB) or “Glow” is all it takes to recharge my batteries. If I’m facing a particularly challenging day I can always watch an episode of “Shameless” or “Weeds” to help bring me back down to earth. Watching those shows make me realize that there are people out there facing much bigger problems than mine. 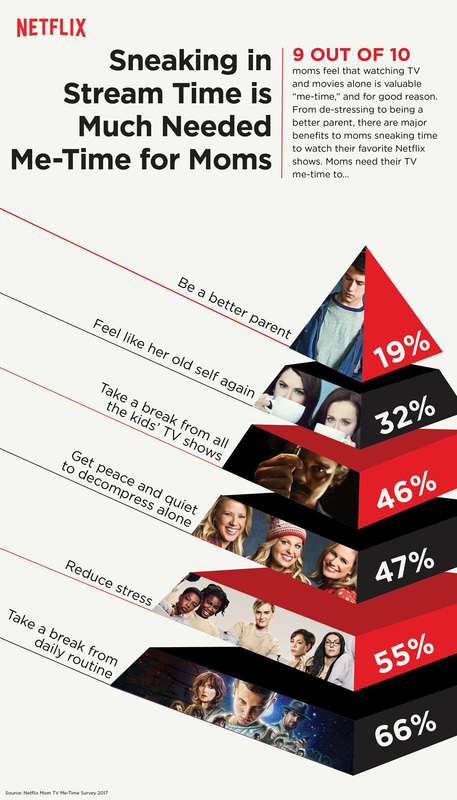 So, if you are feeling rushed, stressed, or just overwhelmed make sure you #MomSneak some Netflix time. That way you are not walking around with an empty cup. Places to go, people to see and shows to watch. With the kids around all summer long, finding a moment of solace can seem impossible—but you just have to get creative. Check out the official roadmap of where moms are sneaking in their TV “me-time” away from the little ones both in their homes and all over town. Where does your sneaking routine fit on the map? Fill out the rafflecopter form below! You can come back each day and get additional entries by sharing the giveaway! Contest ends on July 28th. On July 29th, a random winner will be drawn and emailed promptly. Update: The winner is Elena Istomina. Disclosure: I shared this post as a member of Netflix #StreamTeam. All opinions are mine. I don’t really sneak in my shows, I make time to watch shows that I am really interested in. So at 10 pm I can get in a couple episodes of the Walking Dead, Z Nation, or Death in Paradise. I watch my shows late at night when everyone is sleeping. Staying up too late binge watching while the kids are in bed. I wait until my kids go to bed to watch my favorite Netflix shows! I sneak in my netflix shows when everyone is sleeping lol. I need to catch up on my shows. I #MomSneak by getting up early in the morning to watch my favorite shows on Netflix with a Hot cup of coffee! It is so much fun to be alone watching Netflix! Just “went to the bathroom” for 21 minutes…or how long my current favorite show is! That’s just one of the ways I #MomSneak! WE are empty nesters so we don’t have to sneak anything in. Just have to find the extra time which can be difficult in the summer. We like watching the Marvel series Flash. I get my #momsneak on while everyone is sleeping. I like Daredevil. I sneak my favorite Netflix shows when I take a bubble bath #MomSneak. #MomSneak I sneak in tv show watching when I am supposed to be taking a nap. I sneak my TV shows when the kiddos are taking their afternoon nap. Thank goodness they both still nap because I treasure that “me” time! I don’t currently have any adult shows I watch to #momsneak, but I used to watch them once all the kids were in bed. I guess I need a Netflix subscription to find some good shows again! I sneak my Netflix time in after the kids go to bed. Most nights I loose track of time and end up with only a few hours of sleep… worth it! I like to #MomSneak to watch Orange is the New Black, Marco Polo and other shows not suitable for little eyes. I watch while I am on the run – literally – in the am!! We sneak our shows once the kids are asleep. I #MomSneak watching Netflix after everyone has goe to sleep. I get my #momsneak in late at night when everyone is asleep. #MomSneak I watch my netflix shows late at night when every body is sleeping.